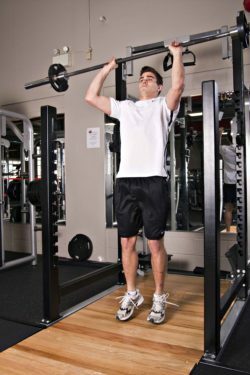 The push press has been practiced for literally decades and has been a core exercise with Olympic athletes of all sorts. It is also the finishing portion of the clean and jerk movement that is contested in the sport of Olympic Weight Lifting. The push press is not so much a strengthening exercise as it is a nervous system stimulus. What this means is that for the most part, this exercise improves your nerve signals to your muscles, ultimately recruiting more and larger fast-twitch fibers (the kind that build explosiveness). Generating explosiveness in this movement comes from the legs, in conjunction with the core. The bar is actually ‘thrown’ into the air from the jumping movement that is initiated by the legs and core. The final position with the bar overhead does not depend a significant amount the shoulders lifting the weight. For these reasons, anyone who stands on their legs during competition or training will benefit from incorporating the push press into their routine. Setup: The setup for the push press is very important. The bar is actually placed in an unfamiliar position on top of your clavicle (collar bone). In this position, the elbows are rotated forward and up, while not being allowed to drift outward. Perfecting this position will take some time, so be patient and practice it in a mirror as much as possible. Place your feet shoulder width neutral position, and make sure your abdominal and lower back muscles are tight and ready. Start: With your head up in a neutral position and arms in place, tighten your abdominal muscles and bend your knees slightly. Midpoint: Using the power from your legs, hips and core, perform a jumping movement, which will allow the bar to be pushed overhead. Your feet should leave the ground slightly through the midpoint. Top: The momentum of the explosive push will guide the bar to the top position, where your shoulder muscles including the rotator cuff muscles will then stabilize the bar. Once under control, bring the bar back to the Start position, bending your knees slightly to absorb the weight. Note: Work on technique with lighter weights the first few weeks. Always be aware of where your head is positioned as there have been incidents where the bar has struck the athlete’s jaw when their head was too far forward. Muscles Used: Quadriceps, gluteal muscles, adductors, calf, spinal erectors, abdominals, triceps and deltoids!